The National Geographic TV Channel (NGC) 2017 production, “Parched: Global Water Wars,” which most recently aired on April 4, is unbalanced and misleading. The first half-hour of the hour-long program is devoted to various water related crises around the world seemingly as a prelude to the entire (except for a five-minute China/India segment) remainder of the broadcast – the Israeli-Palestinian conflict. Here, National Geographic seems invested in advancing the bogus notion that Israeli influence regarding West Bank water resources is a main factor, if not the main one, fueling that conflict. The broadcast is only superficially covered on the NGC Website. Israeli and Palestinian views are presented. The Israeli speakers are generally non-political while the Palestinian speakers unsurprisingly are generally propagandistic. Misleadingly, outside speakers include echoes of the Palestinian victimization propaganda narrative. But most egregiously, the narrator reinforces that false narrative in key instances. The program vilifies Israel by conveying false impressions especially that Israel steals water from the Palestinians. On the contrary, Israel, which has spent many years developing water sources and installing advanced effective irrigating systems, provides water to the West Bank Arabs despite the stark reality that the Arab populace is largely hostile to the Jewish state. The hatred is fueled by a steady stream of anti-Semitic, anti-Israel incitement from Palestinian media, mosques, and schools that underlies the conflict with Israel. This incitement violates Article 26 (2) of the U.N. Universal Declaration of Human Rights, as well as Israeli-Palestinian agreements. Unsubstantiated claims are made that “hundreds of thousands [of West Bank Arabs] live without access to any water infrastructure” (the narrator) and “… they purchase water by tankers, and this is very expensive, and the quality-wise, very bad” (Abdel Rahman Tamimi, a Palestinian official). The West Bank is actually surrounded by water. The Jordan River flows along its eastern border, and the territory sits atop the region’s biggest aquifers. Under Israeli occupation, Palestinians are barred from accessing the River, and from tapping into the water underground [aquifers]. To make up for the shortage, most Palestinians have no choice but to buy water from the Israeli national water company, Mekorot (narrator). Narrator’s monologue here misleads viewers. Palestinians are not barred from “tapping into the water underground [aquifers].” Israelis share these with the Palestinians including those that straddle the Green Line separating Israel from the West Bank. The Israelis do take a much larger share from these Green Line aquifers. As to access to the River Jordan, that is governed mainly by a 1994 agreement between Jordan and Israel. 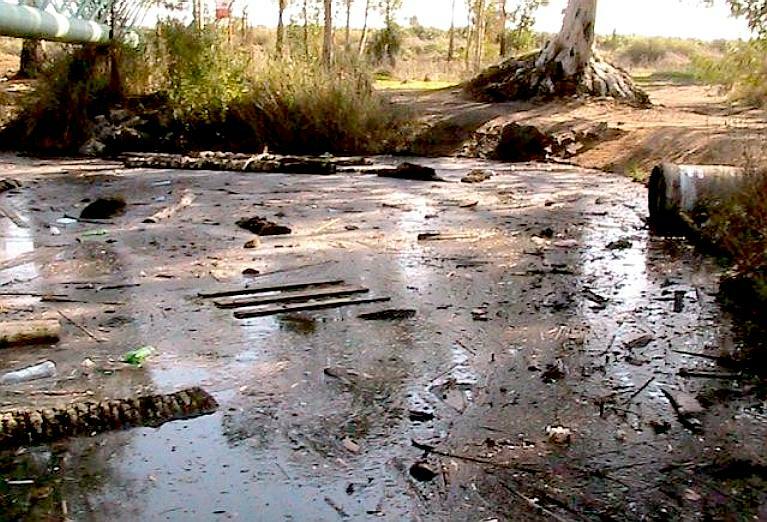 Usage of the River is now severely restricted by the controlling parties, Jordan and Israel, because the water level has fallen very low and several of the river’s sections, if not most, are severely polluted. Narrator states, “Some studies claim that the 380,000 Israelis living in the [West Bank] settlements consume up to four times the amount of water as the West Bank’s Palestinian population.” Which studies? Narrator fails to elaborate. Unsurprisingly, each of the Palestinians interviewed complains bitterly about access to water, faulting Israel for alleged problems and generally alleging a political agenda. For example, “The point is obvious. It’s just to force people to leave the land, because when you don’t have water, people leave” (Dr. Shaddad Attili, head of the Palestinian Water Authority). Can the settlements be considered “illegal” or “immoral”? Basic international law in this case, the League of Nations’ Palestine Mandate, Article 6, calls for “close Jewish settlement” on the land west of the Jordan River. Article 6 is incorporated by Article 80 of the U.N. Charter, sometimes referred to as “the Palestine article.” The United States endorsed the mandate, including Article 6, in the 1924 Anglo-American Convention. The West Bank is not sovereign territory of any country, but rather land disputed by both Israel and the Palestinian Authority. It was illegally occupied by Jordan from 1948 to 1967, when Israel took control as a result of successful self-defense in the 1967 Six-Day War. to which Jews as well as Arabs have legitimate claims, is to be resolved in negotiations as called for in the resolution and by U.N. Security Council Resolution 338 (1973). Meanwhile, Jewish villages and towns built in the West Bank (Judea and Samaria, the ancient homeland of the Jewish people) on Jewish-owned land since 1967 are no more deserving of condemnation than are Arab villages built since then in previously existing Arab villages and towns. “[Israeli Prime Minister] Ariel Sharon said that the Six-Day War was as much about water as about land. In one stroke, Israel went from being dependent on trans-boundary water inflows, to being the trans-boundary water controller of its sub region. So that war was a water war of a kind that we have rarely seen in modern times” (Brahma Chellaney, Professor of Strategic Studies at the New Delhi (India) based Center for Policy Research). But the evidence shows that the 1967 war was forced upon Israel by the imminent threat posed by hostile Arab countries committed to the destruction of Israel. Furthermore, a viable case cannot be made that there was a pre-intention to occupy more land or resources. Whatever Sharon said or did not say (there are various claims) about the circumstances leading to the Six-Day War, this is what happened: While it’s true that water resources was one of the factors in increasing tension between Israel and its Arab neighbors especially with Syria which had begun diverting water from the Jordan River in retaliation for Israel’s tapping the Jordan River by canal for irrigation of the Southern Negev desert, the Six-Day War was not a war about water. This war — the third major Arab-Israeli conflict — was in a sense a continuation of the first two wars. Broadly speaking, the causes of the fighting in 1967 overlapped with the causes of fighting in 1948 (Arab rejection of Israel) and 1956 (continued rejectionism and an Egyptian blockade of shipping to Israel). Specifically, the war stemmed from Egypt’s decision to expel United Nations troops from the Sinai peninsula and blockade Israel’s port of Eilat, under international law a casus belli, or act of war, in addition to belligerent Arab threats to destroy Israel. Much of the above could be traced to Soviet meddling and misinformation. Israel was not the aggressor in the 1967 War. By June 4, a military alliance of Egypt, Syria, Jordan and Iraq mobilized nearly 250,000 troops, 2,000 tanks and 700 aircraft on its borders. After weeks of Arab threats and aggression, Israel – a country the size of New Jersey with a population then of about 2 million – pre-empted encirclement with strikes against Egyptian and Syrian forces. Did the Arab encirclement mean war? In 1964, Egyptian President Gamal Abdel Nasser declared that “the danger of Israel lies in the very existence of Israel.” Syria simultaneously shelled Israeli farms and towns from the Golan Heights. Syrian attacks grew more intense in 1965 and 1966, as did Egyptian rhetoric. Mr. Nasser stated, “[W]e aim at the destruction of the state of Israel.” Arab terrorist infiltrations and attacks against Israel increased. By May 1967, Egypt expelled U.N. peacekeeping personnel from the Sinai Peninsula. On May 20, Syrian Defense Minister Hafez al-Assad stressed that “the time has come to enter into a battle of annihilation.” On May 22, in an act of war, Egypt closed the international Straits of Tiran to Israeli shipping. On May 28, Mr. Nasser declared that “we will not accept any … coexistence with Israel.” Israeli forces, after being on high alert for three weeks waiting futilely for international diplomacy to resolve the threat, attacked on June 5. The reason for attacking? To preempt potential annihilation. The segment concludes with propagandistic warnings of Palestinian violence against the Jewish state: “The Palestinian people will not keep silent forever. If the Israelis continue their unwise policy, they will pay very high price. That is more violence” (Abdel Rahman Tamimi). The fact that National Geographic is in step with Palestinian anti-Israel propaganda should come as no surprise considering previous NG biased reports. Viewers should have been informed that Israel has greatly benefited the West Bank Arabs access to water. A widely acclaimed scholarly book shows that “In June 1967, only four of the West Bank’s 708 cities and towns had running water” and “scarcely ten percent of the West Bank population … were connected to a modern plumbing system.” Now, 96 percent of Palestinian Arabs in the West Bank have “running water piped to their homes.” (Let There Be Water, Seth Siegel [businessman, lawyer, member of the Council on Foreign Relations], St. Martin’s Press, 2015).